Its possible to make a game out of basic maths drills, and this game does just that! As you are making your own dice you can tailor this game precisely to the age and level of your child. Use 3 blank dice, or adapt existing dice with small stickers, to make this game. On the first you put 3 plus signs and 3 minus signs. Number the other 2 dice from 0 to 5. Put the 10 counters in a row in the middle of the players. The youngest starts and rolls all the dice, then does the problem (you may need to remind younger children to put the largest number first in a subtraction problem). The answer to the sum is that player's score. Each player takes a turn and the winner of the round (the player with the highest score) takes a counter or toy from the middle. Play until all the counters have gone and count up to declare an overall winner. This game is easily adapted by changing the numbers on the dice or by using bought dice with 12 or 20 sides. 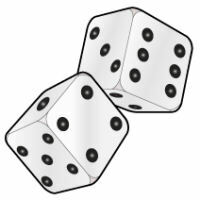 Try practicing times tables by using two normal 6-sided dice or two 12-sided dice and multiplying the two numbers rolled. It's the competitive element that makes this fun! Rather than using counters, find a collection of 10 small toys which are close to your childs heart and rename the game to match. We have used a set of small trolls (found in cereal packets last year) to create a rousing game of Troll! for an older child, and a little bundle of treasured possession (beads, pebbles etc) to create Treasure for a younger child.